Elma, Washington- The biggest IMCA Modified race in the entire Pacific Northwest will take place on Friday July 26th and Saturday the 27th at Grays Harbor Raceway. The dates will mark the annual Shipwreck Beads Northwest Modified Nationals and is sure to attract a large field of cars for two nights of action. 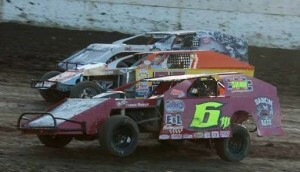 The first night, on Friday July 26th, will be preliminary action consisting of two sets of heat races. The night will conclude with the Race Of Champions which will feature a field full of decorated drivers. The deal of the weekend will be the “Car Load Special” on Friday. Fans will be charged $25.00 by the car load for this night only. But the special isn’t limited to cars specifically. Fans turning out in Trucks, Vans, Motor Homes, etc. are also eligible. So pack those vehicles and come out and see some great racing. Saturday evening will consist of trophy dashes, consolation features, last chance qualifiers, and of course the main event. The Shipwreck Beads Northwest Modified Nationals have proved to be a premier event with the win list comprised of a who’s who in Modified racing. In the last six years there have been six different winners and only two drivers have managed to win it more than once since the first running in 2000. Last year over sixty entries signed in on the registration sheets to compete over the weekend and Mark Wauge would best them all in the final race of the night. For both nights tickets will be for Adults $13.00, Senior (62+)/Juniors (13-18)/Military $10.00, Youths (6-12) $5.00, Youths (5 and Under) FREE, Family Pass (Two Adults and Up To Four Youths) $30.00, and Premium Seating $20.00. Pit gates open at 2:30, front gates, 4:30, and racing starting at 6:30. But don’t forget about Friday’s “Car Load Special” for $25.00 a car load. Shipwreck Beads has the world’s largest selection of beads included in their 22,000 square foot showroom and 80,000 square foot warehouse. Owned and operated by the Vincent family since 1969 the business began as a nautical themed antique store in Olympia near Mud Bay. Supporters of the Grays Harbor Raceway for many seasons as well as the title sponsor of the Northwest Modified Nationals there are few businesses as loyal as the aforementioned company. Visit them at their location at 8560 Commerce Place Driver NE in Lacey, or give them a call at (800) 950-4232, or visit them on the web at www.shipwreckbeads.com. The Grays Harbor Raceway is known for its high speeds and side by side racing as well as its large track size. Hosting racing action from April to October regular classes include 360 Sprints, IMCA Modifieds, USAC Ford Focus Midgets, Street Stocks, Hornets, and for the first time the Northwest Extreme Winged Sprint Car Series. Special events include visits by the World of Outlaw Sprint Car Series and American Sprint Car Series-Northwest Region. You can keep up on all the latest activity at www.graysharborraceway.com for the most-recent news and stories.